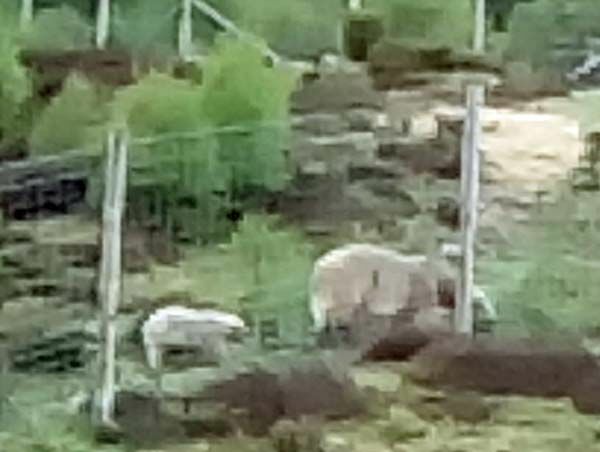 Although I promised to show you pictures of Hamish and Victoria, this was the best shot my Knuphone could manage of them. I am in fact relying on a friend who I knew was visiting the HWP at the same time as me. 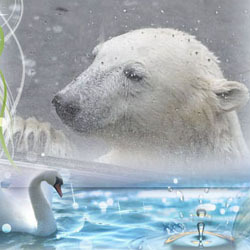 Molly Merrow is a well known US blogger with her own excellent website about the Polar Bears she has visited. 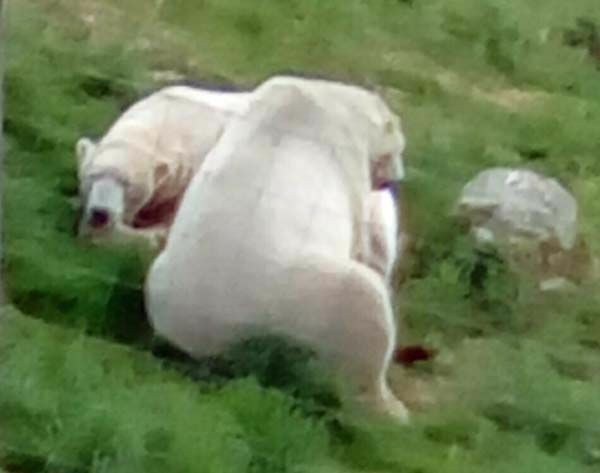 Her wonderful full account of the Polar Bears at HWP is here. When you read the article and see Molly’s pictures and video you will see why I was so pleased to let her do that part of the report. – Molly has kindly ‘donated’ lovely photos to be published even in Knuti’s Weekly so you have probably already seen the article. This is Molly and me posing with Arktos and Walker. 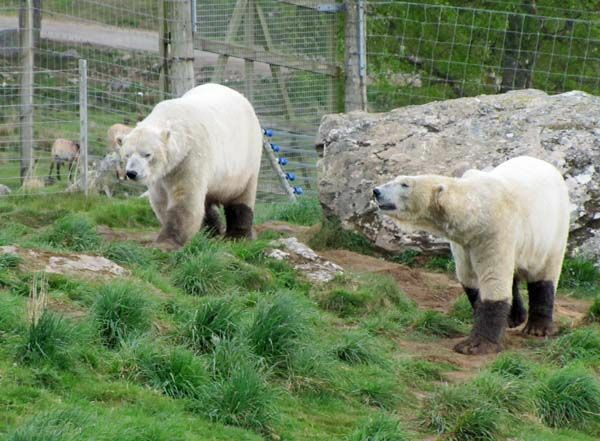 Fortunately Arktos and Walker did come closer to us than Victoria and Hamish. So I can show a few photos here. 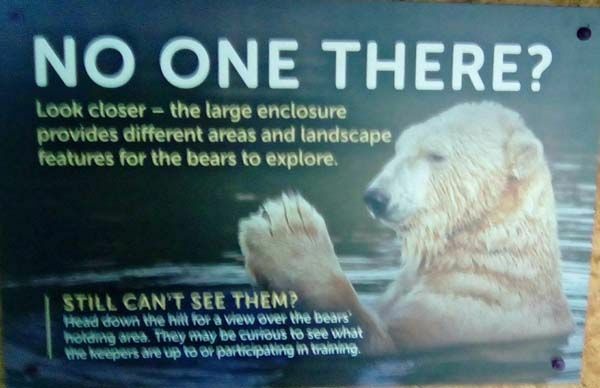 HWP know that the two bears have such a large enclosure that they are very hard to find, so the two signs explain to new visitors what they need to do. 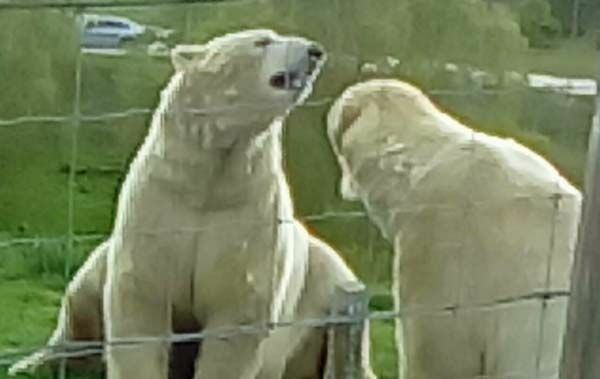 Fortunately, there is a Keeper talk every day when the two are lured close to the fence by various treats. 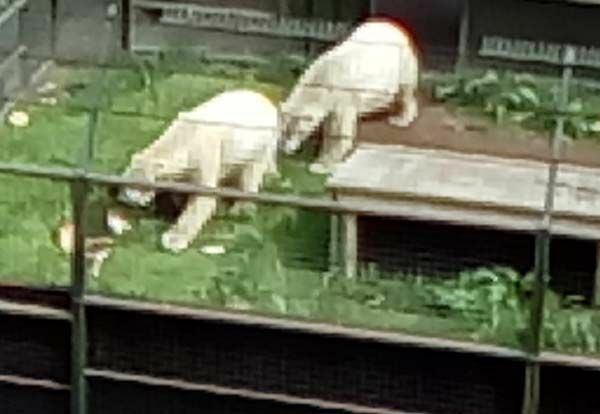 However, on Monday the two were more interested in some activity at the other end of the enclosure and stalked off leaving their snacks. 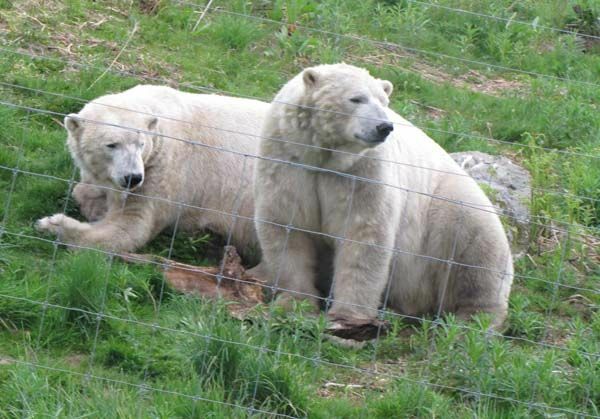 Walker and Arktos share a holding pen at the bottom of a slope. 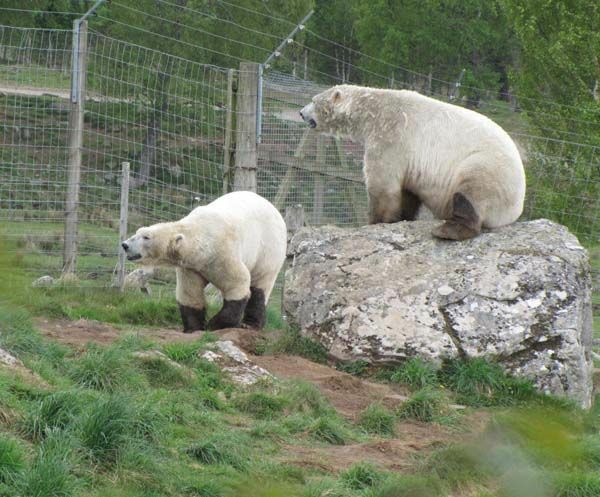 It was originally built to house Mercedes, the sole bear living in Edinburgh Zoo. 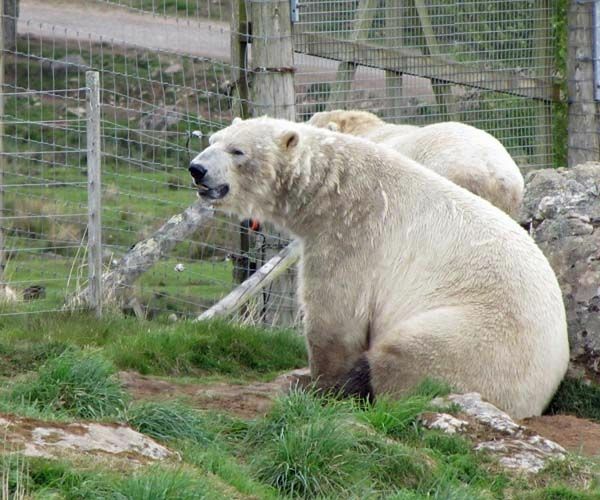 This picture is of Arktos, who is the father of Hamish. 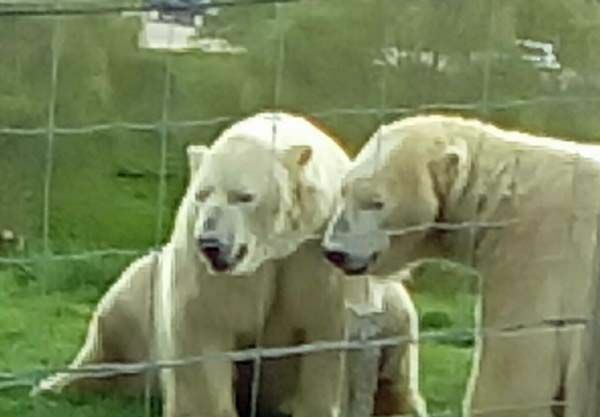 He has the traditional pointed head and triangular ears of the Polar Bear. 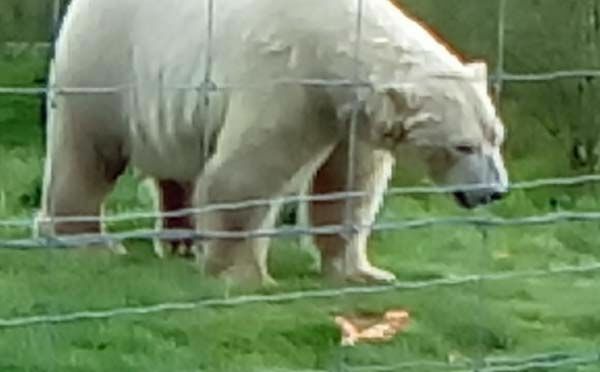 Walker, like Victor in Yorkshire Wildlife Park, who is a relative (see Molly’s blog for this story) has “teddy bear” round ears and a fuller face with shorter snout like a Grizzly. Walker is on the left in this photo. Although Walker growled at Arktos from time to time when sharing snacks, the two soon made up after playfighting. The keepers confirmed that they pine for each other if separated and are really good friends. Certainly in the three days I was there, they did virtually everything together. 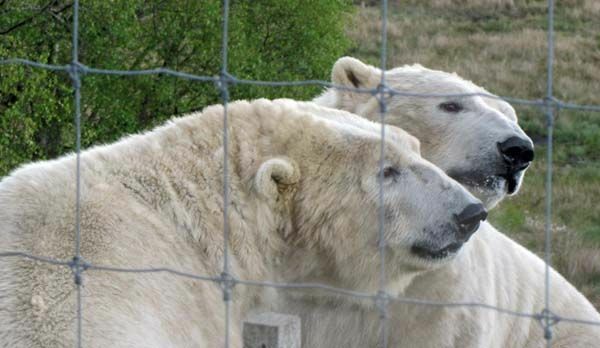 While Victoria is working hard looking after and educating Hamish, Arktos is able to hand around with his best friend, and unlike Bill or Wolodja seems not to miss her. Out of sight and smell and with plenty to do. 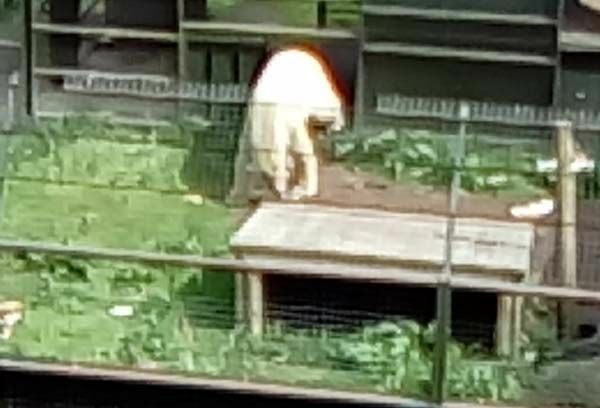 The large enclosures are, of course, wonderful for the polar bears but for the visitors they are sometimes quite a challenge. It often takes a lot of patience if you want to catch sight of them. 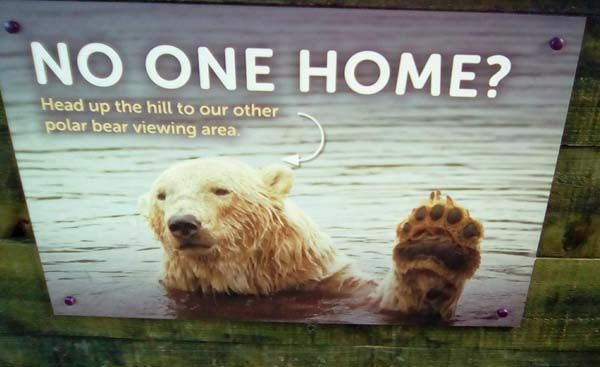 Well, the parks are good for the bears and that’s the main thing. Mercedes had a real kingdom – or queendom – when she lived in this park. Thank you so much for the wonderful photos! 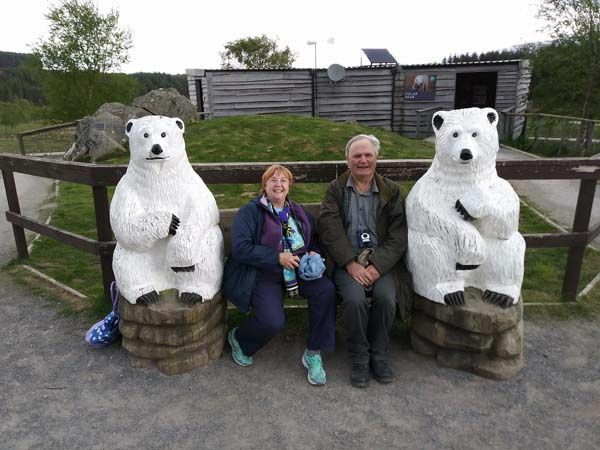 Thank you for taking us along your trip to HWP in Scotland! 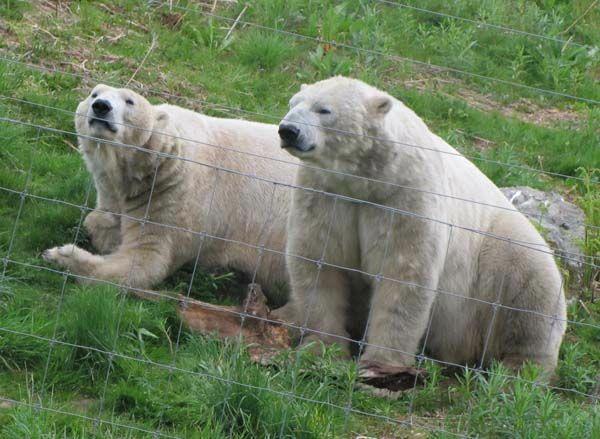 Arktos and Walker as well as Victor and Nobby really hit the jackpot when getting to HWP: large enclosures with everything needed, capable keepers and the company of friends. Hopefully the EEP will make wise decisions in regard of the younger bears future and the places they will go to when time has come! As always your pics from the “Knuphone” are quite special, more like pieces of art or paintings. I like them! Mollys great photos on the other hand show how everything looked in reality…It´s good to have them both. Thank you dear Mervi too for editing the whole thing! 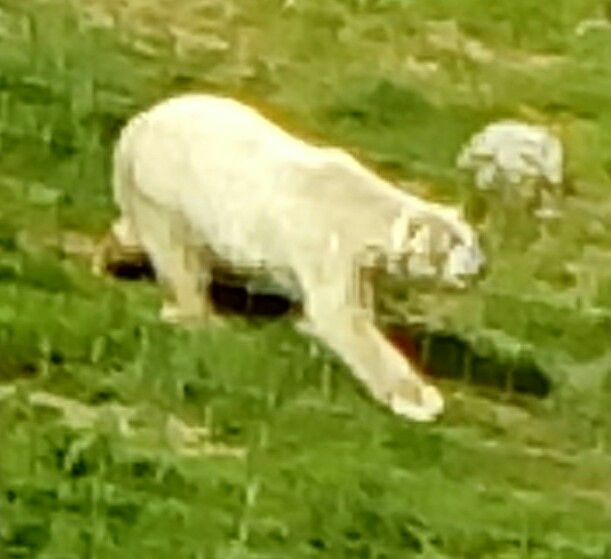 it is great to know that Arktos and Walker have a huge enclosure. thank you for the wonderful pictures. Arktos and Walker in the “black boots” look funny. Thank you for wonderful report and photos. Thanks a lot for the nice report. They look great. The last picture is SUPER!!!! Thank you for the report about Arktos & Walker. 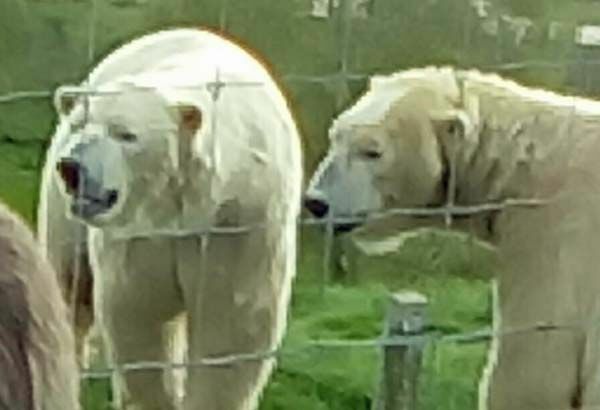 Both bears are in good shape and they are huge. Arktos und Walker sehen richtig gut aus und dass sie immer noch so dicke Freunde sind freut mich sehr. Das Klima passt und auch das weitläufige Gelände ist ideal für die Eisbären. Natüröich brauchen sie auch die richtigen Schuhe und in den Highlands sind Gummistiefel top. Sieht einfach nur lustig auch die schwarzen Beine. Ihr hattet eine schöne Zeit und wir können nun die Bilder und den Bericht geniessen. Dear Ralph and Dear Molly, like I already wrote before: the combination of report and pics is wonderful. 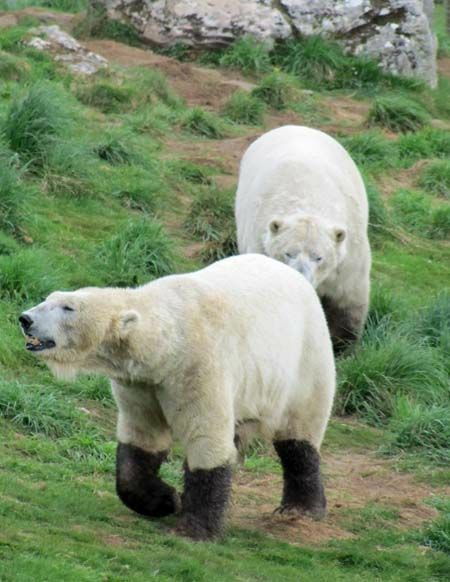 And yes, these boots are made for walking and that is what these polar bears do!! Thanks for nice report and photos! ‘These boots are made for walking’ is the final clou of your again very informative and entertaining report. Lovely phot of you and MOLLY! 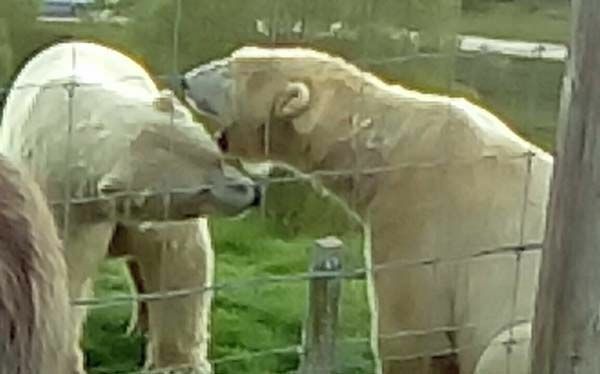 thank you so much for your nice report and for all the wonderful pictures from the Highland Wilflife Park.